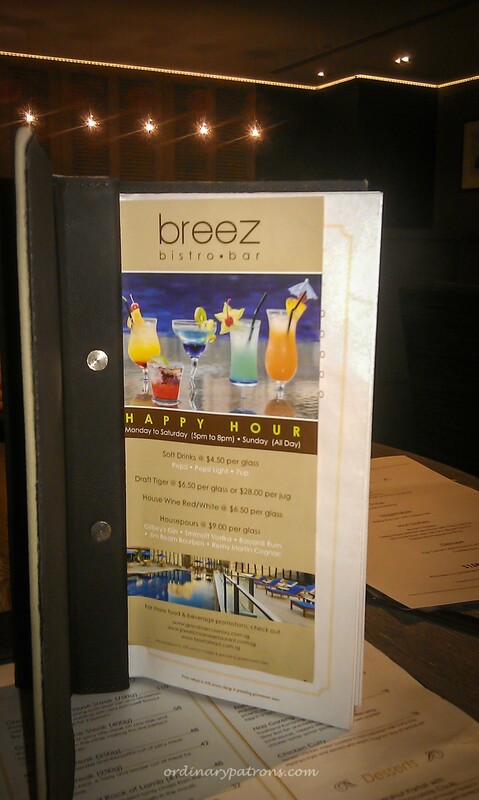 breez bistro.bar is a small restaurant hidden on the 4th floor of Grand Mercure Roxy Hotel in East Coast (Opposite Parkway Parade). It has a casual elegant decor with a view of the hotel’s swimming pool. Guests may choose to sit in the air-conditioned comfort of the indoor restaurant and bar area; or outdoor by the pool. They have a wide selection of drinks anytime of the day with “Happy Hour” from 5 pm to 8 pm and all day on Sunday! The menu offers a mix of local dishes and international fare like “kampong chicken” pizza, wagyu burger, steaks and vegetarian pomodoro penne. We ordered a roasted spring chicken and their beef hor fun. The chicken came with pita bread with curry spice mix and olive oil offered as dips. The hor fun came in a very large portion; too large for a person with average appetite actually. To justify its $20 price tag, there was a very generous serving of thick beef slices. The food was nice though not something you would go out of your way to try. breez bistro.bar is a good alternative if you are in the East Coast area and want to enjoy a meal in a comfortable setting away from the crowds. Average price per person for dinner – $30.